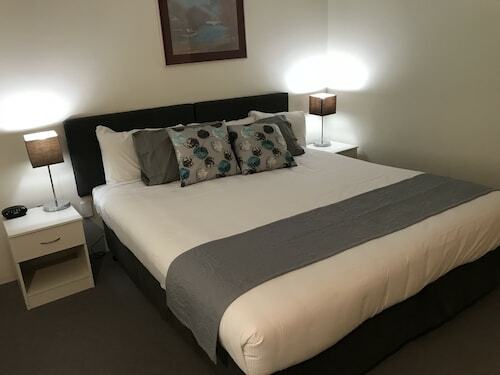 Situated in Tea Gardens, this motel is within a 15-minute walk of Myall Lakes National Park, Tea Gardens-Hawks Nest Bridge, and Jean Shaw Koala Reserve. Pelican Park and Hawks Nest Golf Club are also within 2 mi (3 km). 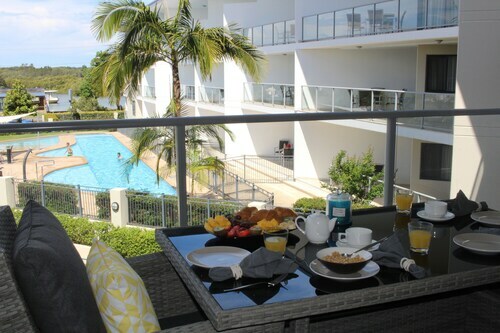 Situated near the beach, this apartment building is within 1 mi (2 km) of Myall Lakes National Park, Tea Gardens-Hawks Nest Bridge, and Jean Shaw Koala Reserve. Pelican Park and Hawks Nest Golf Club are also within 3 mi (5 km). Situated in the lovely Hunter / Mid North Coast part of New South Wales, Bulahdelah is a great base for exploring the many delights of the Myall Lakes. 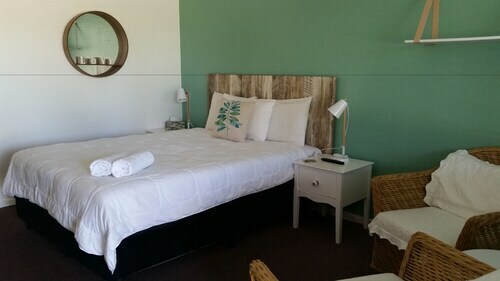 We have a terrific choice of Bulahdelah accommodation suitable for all budgets and groups, so why not check them out? Mountains, forests, beaches, lakes, historical attractions, and cultural delights are all within easy reach. You are certainly guaranteed a fabulous holiday. 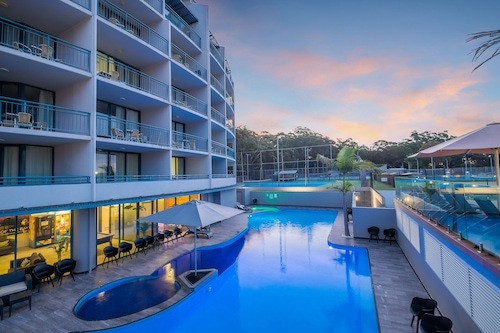 Whether you’re looking for a perfect destination for a romantic getaway, somewhere to take the kids for oodles of family fun, an exciting place to enjoy with your mates, or somewhere with lots of team-building activities, Bulahdelah ticks all the boxes. 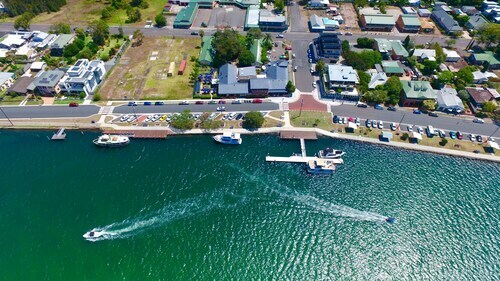 A major gateway to the spectacular Myall Lakes, Bulahdelah has a friendly and welcoming atmosphere, with rivers and streams connecting the shallow lakes. You can spend days exploring the beautiful lakes and enjoy activities such as hiking, biking, picnicking, boating, sailing, kayaking, jet skiing, fishing, bird watching, and swimming. 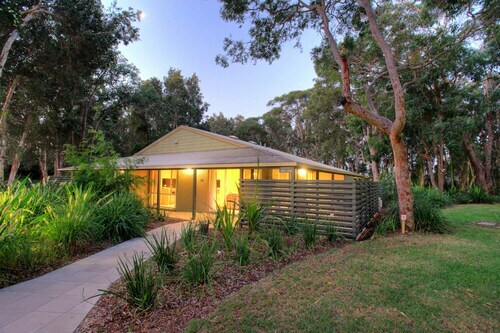 Other activities available in the nearby areas include golf, four wheel driving, bushwalking, bowls, and tennis. Spot the local kangaroos and koalas. Some top attractions include Myall Lake National Park, the Myall River, Bombah Broadwater, and O’Sullivan’s Gap Flora Reserve. You can also see the tallest tree in the whole state, the mighty and towering Grandis. Enjoy sweeping views from Alum Mountain, including the town below and the coast. You can really get a feel for the area’s industrial past as you pass by abandoned mining machinery and equipment and old blast caves. Wootten Historical Railway Walk is another great way to learn about the area’s past. Stroll along the river and enjoy the views. There are plenty of arts and crafts in the area, as well as top rate wineries and vineyards. Bulahdelah Court House shows off the town’s heritage. There are good greati shops, bars, restaurants, cafes, a supermarket and gas stations to fill up on. You’ll find plenty more incredible beaches and scenery in in the surrounding areas include Seal Rocks, Bombah Point, Barrington Tops, Hawks Nest, Nerong, and Coolongolook. If all this sounds appealing, why not start putting your travel plans in place? 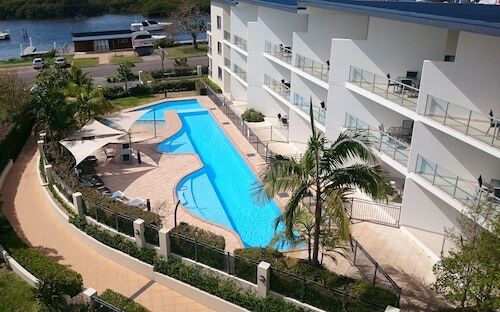 Get your flight to Taree sorted, book your Bulahdelah hotel with us and start counting down the sleeps! How Much is a Hotel Room in Tea Gardens? Hotels in Tea Gardens start at AU$136 per night. Prices and availability subject to change. Additional terms may apply. Friendly family run business. Kids are encouraged to play outside in a safe protected area. This is unusual, and very welcome in a motel. We were travelling from Canberra and checked my details and realised that check in time was only between 2pm and 5pm. I phoned to inform reception that we might not make 5pm. I was informed about the safe for late travellers. As it was we arrived at 4:52pm, but the reception had closed. Our key was in the safe. The room was newly renovated. Bed was comfortable and we had water glimpses. Close to food and shops.